Panchase Trekking being one of the non-tourist areas lasts for about 6 days and offer you varieties of spectaculars such as Annapurna and Dhaulagiri mountain views, ethnic villages, cultures, and the lifestyles of those especially from the western part of Nepal. Furthermore, it's always done with a guided group and tented. Panchase Trekking commences from the lakeside town of Pokhara traveling south west before looping into the main Annapurna trekking region. The area around Panchase is well known for its array of bird and wildlife. The first five days trekking are away from the more frequented trails providing an opportunity to experience the wealth of culture to be found in this area. We eventually arrive at Ghandruk the largest Gurung village in the region and the Center of the Annapurna Area Conservation Project. We rest up for a day to explore this ornate Gurung village which provides some serious views of the mountains Macchapucchare (Fishtail) Annapurna South and Himchuli before a two day trek back to Pokhara. Himalayan sights: Mount Dhaulgairi, Nilgiri, Annapurna Himalaya range, Fishtail mountain, Annapurna south Himal, Lamjung Himal etc. 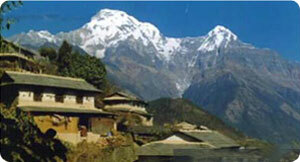 Splendid breathtaking place: Panoramic Himalayan views of Annapurna Himalaya range and panchase village. Day 10: Pokhara back to kathmandu by flight/Tourist bus. Day 11: After breakfast, our tour guide will take to for historical monuments sightseing in kathmandu valley such as Bhaktapur, Pasupatinath, Boudhhanath, Kathmandu durbar square and Monkey temple(swyambhunath) and in the evening farewell dinner in Restaurant, overnight at kathmandu in Hotel. Day 12: After breakfast, Relaxing/shopping with own activities than drop to Kathmandu international airport for onward journey.